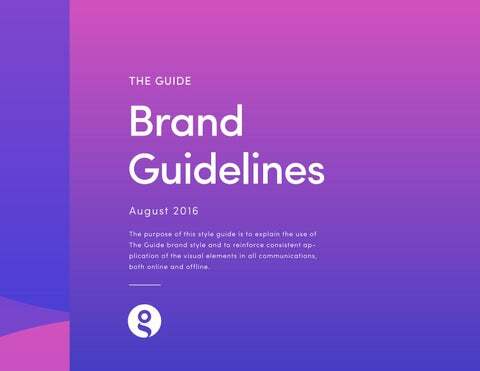 Brand Guidelines Aug u s t 2 01 6 The purpose of this style guide is to explain the use of The Guide brand style and to reinforce consistent application of the visual elements in all communications, both online and offline. Our mission’s brand is to make the world connect and expend faster it’s knowledge. Through our online platform we help people to connect, learn, explore and share their knowledge and what maters most to them. This way we are maximizing and straighten people’s ability to build and improve their knowledge which gives them the chance to contribute for the growth of other people lives. Ou r p er so na lity Informed, tech-savvy, future oriented, open, honest, innovative, exploratory, energetic, responsible, fun, approachable, open and brave. To bring to the world a lifestyle of exploratory learning thorough fun and intelligent online learning. are recognized and distinguished in the market. ers and with our employees. What is our look and feel? W ha t is a Moo d B o ard? The mood board is a fun way of establishing the aesthetic and visual feel of our brand which has given us the inspiration of creating our brand look and feel. The board is basically a loose of visual interpretation that the brand identity should take, but please note that this doesnâ&#x20AC;&#x2122;t mean that the brand is meant to be taken literally and automatically like in our collage. open and we connect with the community. Clear Space Clear space is separating the logo from other elements such as headlines, text, imagery and the outside edge of printed materials. The x equals to the hight/wight of the logo. It is important to not get the logo mixed up and loose the visibility. The following list contains some examples of prohibited use of the logo in order to maintain a coehensive look over the online and offline chanells. shades are different than color opacity. This graphic is made to give you an idea of how you can balance the colors in The Guide branded materials. S ofia Pro C o n d e n s e d ABCDEFGHIJKLMNOPQRSTUVXYZ abcdefghijklmnopqrstuvxyz 0123456789&?$! ABCDEFGHIJKLMNOPQRSTUVXYZ abcdefghijklmnopqrstuvxyz 0123456789&?$! ABCDEFGHIJKLMNOPQRSTUVXYZ abcdefghijklmnopqrstuvxyz 0123456789&?$! S ofi a Pro ABCDEFGHIJKLMNOPQRSTUVXYZ abcdefghijklmnopqrstuvxyz 0123456789&?$! ABCDEFGHIJKLMNOPQRSTUVXYZ abcdefghijklmnopqrstuvxyz 0123456789&?$! ABCDEFGHIJKLMNOPQRSTUVXYZ abcdefghijklmnopqrstuvxyz 0123456789&?$! Body typography The Guide primary typeface for body copy on printed and online materials is Sofia Pro Light. The typeface is to use on all documents. Typical applications include letters, presentations, websites and documents. The alternative for web safe usage is Questrial/Century Gothic/Arial typeface. 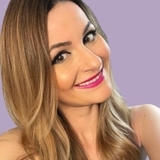 Sofia Pro L ig ht ABCDEFGHIJKLMNOPQRSTUVXYZ abcdefghijklmnopqrstuvxyz 0123456789&?$! ABCDEFGHIJKLMNOPQRSTUVXYZ abcdefghijklmnopqrstuvxyz 0123456789&?$! ABCDEFGHIJKLMNOPQRSTUVXYZ abcdefghijklmnopqrstuvxyz 0123456789&?$! Nibh Cras Ullamcorper Mattis Ultricies Donec id elit non mi porta gravida at eget metus. Cras justo odio, dapibus ac facilisis in, egestas eget quam. Nulla vitae elit libero, a pharetra augue. Duis mollis, est non commodo luctus, nisi erat porttitor ligula, eget lacinia odio sem nec elit. Donec id elit non mi porta gravida at eget metus. Recommendations You can use both solid and gradient backgrounds. It is recommended to use only the colors from the primary color palette including the tints and shades of it. How are we using the gradients? Gradient b a ckg ro u n ds Gradient backgrounds can be used in combination with other graphic elements or with photography. It is recommended to be used for achieving contrast and not be used excessively. Some examples can be seen on the next page. Recommendations The patterns are to be used to give the brand a particular style. It is recommended to not be used excessive and always be combined with light elements. Ridiculus Egestas Condimentum Donec id elit non mi porta gravida at eget metus. Cras justo odio, dapibus ac facilisis in, egestas eget quam.